L of string 265 mm, Diam iron bead 3.2 mm, D brass bead 4.7 mm [RTS 5/4/2004]. Plant fibre string, made of two twisted strands, on which 28 small iron disc beads, 114 brass convex sided ring beads, 1 thick brass disc bead, 15 brass convex sided ring beads and 25 iron disc beads have been strung. The string is tied and knotted twice at the top. Each bead appears to have a seam down one side. The necklace is in one piece, with all beads in place, and only minor corrosion around the edges of the brass ring beads. The iron is currently a metallic grey colour (Pantone 423C), the ring beads a dull metallic yellow (Pantone 873C), and the single brass disc bead a brighter metallic yellow (Pantone 871C). The string is 265 mm long, the smaller iron beads have a diameter of 3.2 mm, and the brass ring beads a diameter of 4.7 mm; the whole necklet weighs 43.7 grams. Collected by Percy Horace Gordon Powell-Cotton and his wife Hannah at Loronyo on 13th April 1933, during a shooting expedition. It is known in Lotuko as nataka. Schweinfurth discusses the role that early iron beads had to play in the Southern Sudan, amongst groups like the Jur Luo: 'iron beads or perforated little cylinders of iron… were earlier in use than glass beads… In the Soudan these string of beads were principally made at Wandala, and Barth has specially noted them at Marhi. Every tribe which I visited in proceeding inland from the Gazelle I found to retain the preference for beads made of iron (G. Schweinfurth, 1873, In the Heart of Africa Vol. I, 203-4). Accession Book Entry [p. 248] 1934 [insert] 8 [end insert] - MAJOR P. H. G. POWELL-COTTON , Quex Park, Birchington, E. Kent. Specimens collected by himself & Mrs Cotton, during hunting trips, 1933, viz: [...] [p. 252] - From the LATUKA tribe, NAVERA, TORIT, LARONYO. [p. 254, insert] 68 [end insert] - Necklet, nataka , of strung brass & iron beads, ib[idem] [LARONYO] (667). Related Documents File - Typewritten List of "Curios Presented to Dr. Balfour by Major & Mrs. Powell-Cotton. Latuka Tribe". 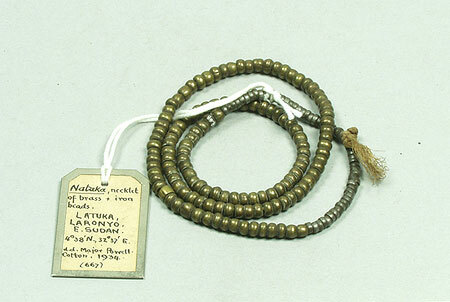 This object appears as item 667: "Brass & few iron beads necklet, native name Nataka , 13/4/33 Laronyo 4.38 N 32.37 E”. Also contains details of a cine film 'some tribes of the Southern Sudan', taken by Powell-Cotton during this 1933 expedition, copies of which are now in the National Film and Television Archive and the Powell-Cotton Museum in Kent [RTS 14/3/2005]. Sparks, Rachael. "Lotuko necklet" Southern Sudan Project (in development). 03 Jan. 2006. Pitt Rivers Museum. <http://southernsudan.prm.ox.ac.uk/details/1934.8.68/>.